The Taoiseach has apologised to the “blameless” Magdalene Laundries survivors for the hurt that was done to them, and any stigma they suffered. 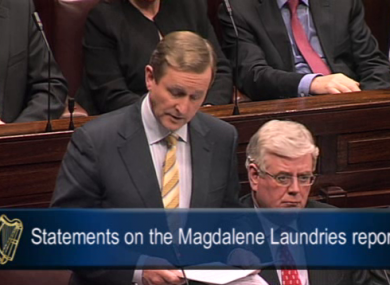 ENDA KENNY HAS apologised to Magdalene Laundries survivors, in an emotional speech this evening in the Dáil. Overcome with emotion, his voice broke towards the end of the speech, as he told the women: “Let me hope that this day and this debate heralds a new dawn for all those who feared that the dark midnight might never end”. The apology received a standing ovation from all present, with the Dáil members looking to the Magdalene survivors in the gallery as they clapped. Therefore, I, as Taoiseach, on behalf of the State, the government and our citizens deeply regret and apologise unreservedly to all those women for the hurt that was done to them, and for any stigma they suffered, as a result of the time they spent in a Magdalen Laundry. The Taoiseach said that the McAleese report “shines a bright and necessary light on a dark chapter of Ireland’s history”. [This] government was adamant that these ageing and elderly women would get the compassion and the recognition for which they have fought for so long deserved so deeply and had, until now, been so abjectly denied. The reality is that for 90 years Ireland subjected these women and their experience to a profound and studied indifference. I was determined because of this that this Government, this Dail, would take the necessary time not just to commission the Report but to actually study it and having done so to reflect on its findings. His apology came days after he met with survivors in London, who had said afterwards that they expected a heartfelt apology from him on behalf of the State. The Taoiseach said that the apology extended to all women who had been admitted to the laundries, as well as women in other residential laundries such as the laundry operated in the Training Centre at Stanhope Street, Dublin. The laundries “have cast a long shadow over Irish life, over our sense of who we are,” said Kenny. Speaking of the women watching the proceedings from the gallery, he said he was privileged to welcome some of the women to the House. What we address today is how you took this country’s terrible ‘secret’ and made it your own. Burying it carrying it in your hearts here at home, or with you to England and to Canada America and Australia on behalf of Ireland and the Irish people. But from this moment on you need carry it no more. Because today we take it back. Today we acknowledge the role of the State in your ordeal. The Taoiseach had been criticised for his initial response to the publication of the McAleese report, with survivors expressing their disappointment at the lack of an apology. It was anticipated that details of a compensation package would also be given tonight, and Kenny told the Dáil that on reflecting on the report, he has come to the view that the women deserve more than this formal apology. That’s why the Government has today asked the President of the Law Reform Commission Judge John Quirke to undertake a three month review and to make recommendations as to the criteria that should be applied in assessing the help that the government can provide in the areas of payments and other supports, including medical cards, psychological and counselling services and other welfare needs. When Judge Quirke has reported back, the government will establish a Fund to assist the women, based on his recommendations. He said that he is determined that the fund will be primarily used to help the women – as is their stated and strong desire – not for legal or administrative costs. He agrees that a permanent memorial to Magdalene survivors should be established, and intends to engage directly with the representative groups and as many of the women as possible to agree on this. It will be financed by the Government separately from the funds being set aside for the direct assistance to the women. Email “Kenny “deeply regrets and apologises unreservedly” to Magdalene women in emotional speech”. Feedback on “Kenny “deeply regrets and apologises unreservedly” to Magdalene women in emotional speech”.